Instead of squeezing already cramped sidewalks with row after row of bollards, the city can use far fewer bollards, at significantly less cost, to cork off busy Midtown blocks from car traffic, giving pedestrians much more freedom of movement. Mayor de Blasio plans to install 1,500 metal bollards along Midtown sidewalks, at a cost of $50 million, to keep pedestrians safe from vehicular attacks. Basic details like the location of the bollards are still to come, but yesterday’s announcement set off two alarms: the high cost for what should be a relatively straightforward installation, and the sneaking suspicion that the bollards will narrow scarce sidewalk space and hem pedestrians in. While there’s no doubt that NYPD’s janky temporary barriers need to be replaced, it would be a terrible mistake to replace clumsy short-term security theater with clumsy permanent security theater. Without getting into the weeds of NYC’s absurdly inflated construction costs, there is an easy way to address both issues. City Hall could stretch its bollard budget much farther, getting far more benefits for public safety and public space, by corking off these streets. NYC DOT has tested out the idea on a small scale. 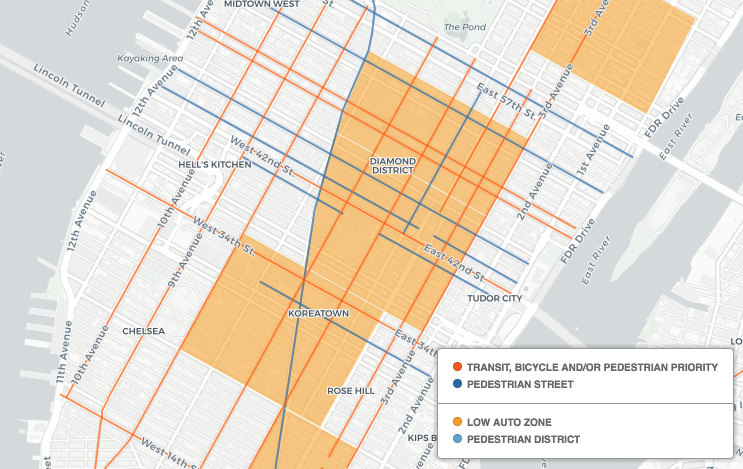 In September, the city set up a car-free trial for an afternoon on a block of 43rd Street near Grand Central Terminal, where pedestrians typically outnumber motorists 16-to-1. People immediately flocked to the new public space (above). East 43rd Street is set to become the city’s next “shared street,” where motor vehicle access is limited to deliveries and local pick-ups and drop-offs, and pedestrians take priority. But there’s no reason to stop there. Other cities are using movable bollards to restrict vehicle access to downtown streets while maintaining or improving the pedestrian experience. In New Orleans, the city recently installed bollards as a security measure to cork six blocks of Bourbon Street, reinforcing rules that ban cars at night. 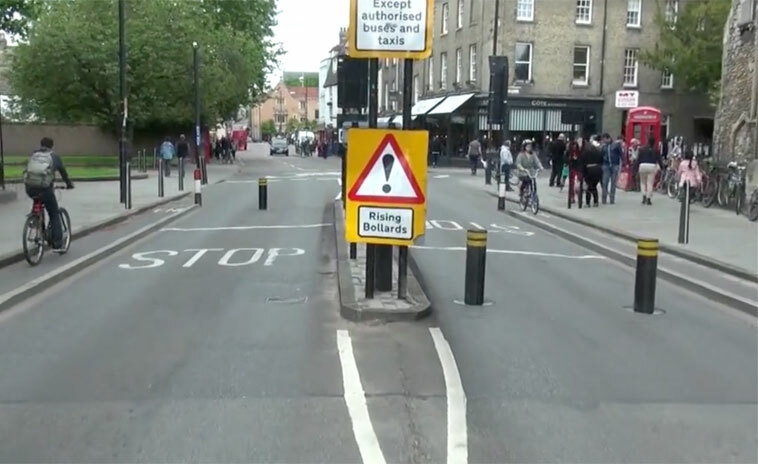 The inner two bollards in the picture below can be moved aside to let motor vehicles pass. 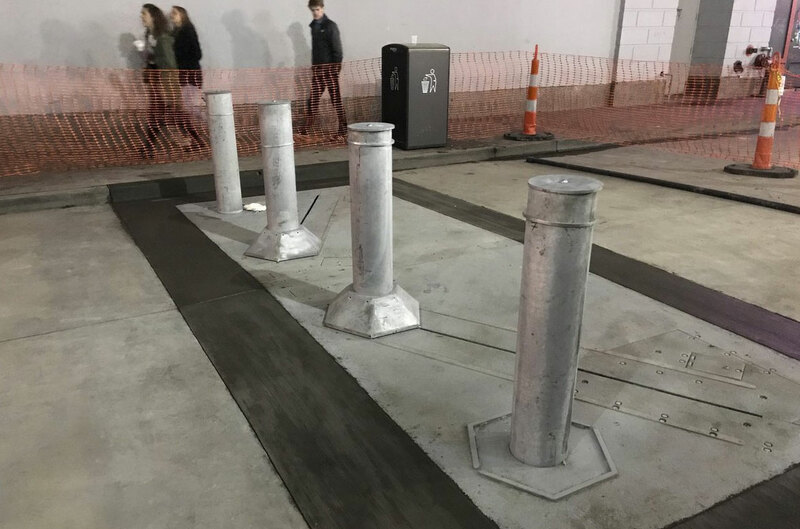 Each set of four bollards cost $60,000 to install, according to the Times-Picayune. New York can’t let the threat of vehicular attacks turn into a justification for diminishing public space. To prioritize safety for the hundreds of thousands of people who walk Midtown streets every day, the city needs to control the cars and give pedestrians more freedom. I completely disagree with this article’s premise: that this has to be an either/or consideration or that widespread bollard on car-filled streets are “security theater”. This clearly states the bollards are part of a larger investment. So there’s no actual info on the bollard cost that I’m aware of. Furthermore, cars don’t belong on sidewalks. And we have plenty of evidence that physical impediments to bad driving are some of the most effective street investments we can make. This is why we have neckdowns, intentionally narrow lanes, speed bumps, and so on. It should not be easy for cars to go onto sidewalks, period. Bollards are an excellent way of making that harder. Car-free streets, as awesome as they are, offer no solution whatsoever to the problem of the streets that do have cars that we don’t trust to drive safely. We need a story for that too. Dude – based on our experience with the methods already used in NYC; we can predict that bollards will be placed to increase roadway allocated to cars and decrease roadway allocated to people; unless we advocate strongly. 1. Where car access must still be allowed, the city the can line both sides of one block with, say, two to four dozen bollards – depending on the length of the block – to keep drivers off the sidewalks. 2. Where car access can be limited, the city can use 4 – 10 bollards on each end of a block to keep drivers off a street entirely. In this case, it’s a good bang for the buck as the length of the block would be irrelevant. The problem is we have a mayor with a heavy windshield perspective and a police department that usually sees pedestrians as a problem to be contained rather than the natural state of cities. I think a lot of us are afraid that it’s *the city* that’s going to make a binary, either/or choice and go exclusively with option number 1. That will create crowded conditions and lock in the car-dominated status quo for a generation or more. I’m glad Streetsblog presented a better vision for our public space than what we’re likely to get. The solutions are so obvious but it doesn’t matter if we don’t have the right attitude and vision at the top. And that is: It shall not be a priority of the Department of Traffic Transportation to ensure that all areas of the city, especially the dense urban core, are accessible by single occupancy vehicles. Once you’ve acknowledged that philosophic reality — then the workable options become plentiful. If you’re thinking: But will residents from NJ/Westchester/LI/ANYWHERE still be able to drive to a Broadway show, then you should be fired. It boils down to whether DOT or NYPD is making the decisions about exactly where the bollards go. DOT has actual street designers who think about pedestrians and cyclists. NYPD is rooted in car culture and a windshield perspective that views public space as a potential threat to order. The NYPD will determine threat risks, but the mayor has to empower the DOT to determine the actual street design and location of bollards. In theory, the NYPD is data-driven and empirical, but when it comes to terrorism, street design and pedestrians, they are sloppy, ignorant and amazingly short-sighted. The World Trade Center was truck bombed in 1993. Has the NYPD shown it’s learned anything about how to protect pedestrian spaces — without functionally destroying them — since then? Right, I think we pretty much envision the same scenario. I don’t take fault with anything in your comment. I’m perhaps mostly disappointed that this article seems sloppy. Its opening sentence, for example, starts with a demonstrable inaccuracy, then only continues to build its argument from there. Who designed the awful vehicle barricades around Broad and Wall Streets? Something like the Bourbon Street Bollards would be much more appropriate, or even this checkpoint on North End Av. Bollards can and should elevate the design of the street, not degrade it. The mayor said the city will install more than 1,500 metal bollards to protect pedestrians at key locations beginning in March.